This 220 square metre new home is located on the first floor [on 220 Ocean Drive Quinn's Rocks ]separated from the beach only by a quiet road and across from a lovely park. Stunning ocean views, air conditioning a two person spa are only some of the features of this beautiful home. The air conditioned villa has 3 bedrooms with a lounge/4th bedroom, accommodating up to 6 people; a living area with TV and DVD/VCR as well as a large kitchen with granite bench tops, large dining room (table sits 8 people) and 2 bathrooms including ensuite. The large alfresco balcony contains an outdoor table, 8 chairs and a BBQ so is idea for entertaining and enjoying the sun sets. The Villa also has Wireless Broadband Internet access as well as a printer, scanner, copier, fax and telephone available for local calls. Just bring your laptop and you can use the internet at your leisure. Other features include a cot and high chair and a baby gate for your young children. On your arrival, the kitchen will be stocked with breakfast items and the owners are available at any time for assistance or other requests. This unique BEACHFRONT holiday home includes air-conditioning to the open plan family and meals area, master bedroom, and second bedroom; there is a cot and high chair for baby too. Approximately a 15 minute drive north you will find Yanchep National Park. Here you can see koalas, kangaroos, native birds and plants. There are also bbq and picnic facilities if you don\'t fancy that there is the historic Yanchep Inn. Whiteman Park is another great place to visit and less than a 25 minute drive away. If you fancy a game of golf then why not book yourself a round at the Joondalup Golf Club which is only a 10-15 minute drive away, or maybe go to Carramar Golf Club. If your golf isn\'t that good you may prefer a round of miniature golf at Wanneroo Botanical Gardens, for more details please browse the internet. 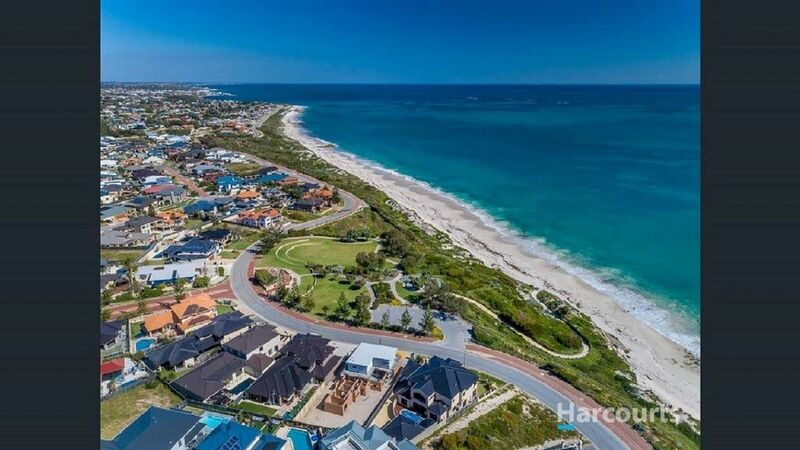 Hillarys Boat Harbour, is less than 20 minutes drive away and is a great place to spend the day, while there visit AQWA, it\'s great for children and adults alike. Here you can explore 1,000\'s km of Western Australia\'s coastline in just one day!! There are several fantastic restaurants, bars, and cafes in the local area to Villa Paradiso, amongst them is the Hogs Breathe Cafe which is great for the whole family. If you go to the Mindarie Marina you will find the Boat, the Indian Ocean Brewing Co and the Coffee Deck all of these do great food. Just down the road from Villa Paradiso you will find the Saltwater Cafe so you can see you will be spoilt for choice! Note: Pricing is subject to change. You should confirm pricing with the property owner. Information If you would like to call the property, the property\'s phone number will be displayed on screen and emailed to you as soon as you complete this form. book for 4 or more weeks and receive 10% discount. excellent stay. fabulous views. lovely owners. Beautiful location. Would highly recommend. Will return and so will our relatives. Loved the place. Great location with stunning sunsets from the terrace. Beach is amazing as are the local people. Appartment is very spacious, well equipped and very clean. We had an awesome week here. We stayed 10 days in this wonderful & spacious accommodation directly opposite the ocean. Sleeping and relaxing to the sounds of the sea was glorious. The hosts gave us complete privacy, a lovely place to stay. Value for money was excellent. We will be back!